Presbyopia is the gradual decline of your eyes’ ability to focus on near objects, causing objects to become blurry for near vision. 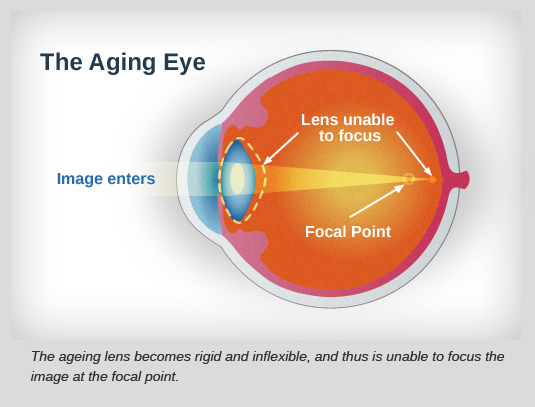 Most people experience presbyopia in their late 30s to early 40s. If you’ve noticed that you have to hold a book farther away to read than you used to, you probably have presbyopia. The eye surgeon will usually correct one eye (the less dominant eye) first. This will usually result in good quality vision at all visual distances. If this goal is achieved, treatment of the other eye can be similarly offered. 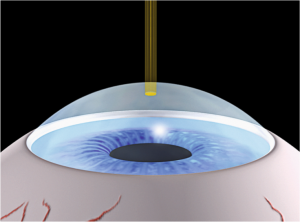 The eye surgeon will correct both eyes with laser vision correction. One eye will be corrected to see clearly in the distance (your dominant eye), and the other eye (your non-dominant eye) to see better for your near vision activities. 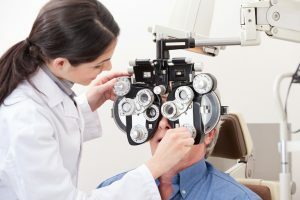 You will have to undergo a pre-LASIK evaluation which comprises a series of eye tests, checking your eye power, cornea thickness and general eye health. You will find out if you are suitable for presbyopia correction here. Optometrist doing sight testing for patient. 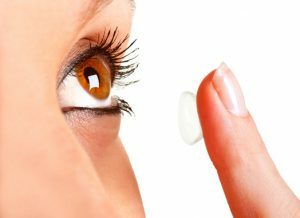 To allow you to experience and adapt to Monovision or PresbyMAX, the eye doctor will provide you with trial contact lenses to be worn in one of both eyes. You will wear these trial lenses for about 1 -2 weeks. Usually after 1 – 2 weeks, the brain begins to seamlessly use the eyes in a monovision manner. When you are comfortable with your monovision trial lens experience, you can then proceed with laser treatment to permanently correct your vision. Having difficulty reading? Wish to be spectacles free? –> seek a solution to your Presbyopia woes today at Clearvision Eye Clinic! Feel free to contact 6100 2020 or doctor@clearvision.com.sg for more information.